In a bowl mix 2 cups all purpose flour, salt and yeast. In a large bowl or the bowl of your electric mixer, mix well hot water, oil and sugar. Gradually add already mixed dry ingredients and mix well (at medium speed with the mixer and the dough attachments). Add 1 cup whole wheat flour and mix again. Add about ½ cup white flour and mix about 5-6 minutes or until a smooth dough ball forms, clearing the sides of the bowl. Transfer onto a flat well floured surface and keep kneading it. If dough is too sticky - add some more flour or if it’s too dry - add a couple of tablespoons water. Pour some olive oil into a clean and dry large bowl. Place dough into the bowl and roll it all over until lightly covers with oil. Cover with plastic wrap and allow rise for about an hour or until doubled in bulk. Meanwhile, prepare the pizza sauce. Stew in 2 tablespoons olive oil chopped onion and minced garlic and tomatoes and gradually add about 2/3 cup water and leave to simmer for about 20-25 minutes, stirring occasionally. Once the tomato sauce thickens, add 1 teaspoon sugar to kill the sour taste of tomatoes and add rosemary and basil. Leave to simmer for another 4-5 minutes. Sprinkle with grounded black pepper and salt and remove from heat. Leave to cool. Such prepared, the tomato sauce could be used for garnishing pasta or meat. Cut medium thick "sticks" Cheddar cheese – enough to almost circle the diameter of the pan, which will be used to bake each pizza. 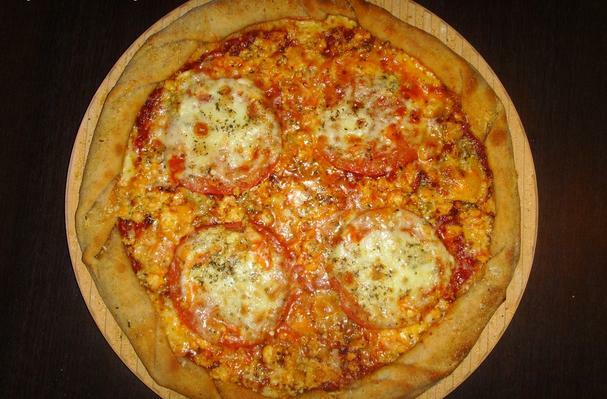 Slice tomatoes and mozzarella - equal amount for each pizza again. Once the dough has doubled in bulk, transfer it again on a flat floured surface. Knead it for about 3-4 minutes and shape it into a ball. With a sharp knife, divide dough into four equal parts, shape those into balls and transfer onto well oiled surface. Part of the dough could be stored in the freezer for about 3 months, after being oiled and put in a separate envelope or container suitable for storage in a freezer. One day prior to use, transfer frozen dough from the freezer into the refrigerator, and about two hours before we started to process it - remove from the refrigerator and leave at room temperature. On a baking paper or dry flat surface, sprinkle a thin layer of the "secret ingredient" or semolina, bread crumbs or :) what we have. Using a rolling pin, roll thin crust, about 2-2.5 inches larger than the diameter of the pan which would be used for baking the pizza in and transfer the crust with the baking paper (or in a well greased) pan. Arrange the Cheddar "sticks" around the periphery of the pizza crust, about 2.5 inches inside the edge. Bring the edges of the crust underneath the Cheddar “sticks”. Spread over the tomato sauce, leaving about 1 inch edge. Arrange sliced tomatoes and Mozzarella. Sprinkle with crumbled Blue cheese. Slice with a potato peeler or grate Parmesan. Sprinkle the edges with the “secret ingredient” (or semolina, bread crumbs, etc.) for crispy crust and sprinkle the whole pizza with 1 tablespoon olive oil. Bake in preheated to 350 F (180 C) oven for 15-20 minutes or until ready. Pizza Quattro Formaggi aka Four Cheese Pizza is the best pizza ever - the authentic Italian taste!! !